Is it time to replace the siding on your home? If your current siding is faded, stained, broken, splintering, or pockmarked by holes left by insects, the answer is yes. Otherwise, your deteriorating siding can weaken your home and lead to costly repairs. Homeowners in Louisville, Kentucky, or elsewhere in Kentuckiana who need new siding can turn to Windows Plus for a solution. We install high-quality vinyl siding that blends easy maintenance with durability and energy efficiency. Our vinyl siding is available in a range of vibrant colors to provide the new look you want for your home. And, thanks to a protective coating, the color will maintain its like-new appearance year after year with only an occasional rinse with soap and water needed. When you choose Windows Plus to install vinyl siding on your home, you can rest easy knowing that your new siding will resist damage from inclement weather. Indeed, our siding is manufactured with durability in mind so that our customers in the Metro Louisville, KY, area can benefit from a long-lasting solution. At Windows Plus, we want to do more than just make your home beautiful – we want to improve its thermal performance, and our vinyl siding accomplishes just that. With added insulation, our siding will help to minimize heat transfer, potentially lowering your energy usage and monthly costs. 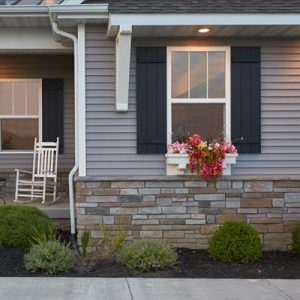 Our siding technicians are factory trained in the best vinyl siding installation techniques and only perform siding installations for us. That way, you can be sure that they are experts in their field and will complete your installation quickly and flawlessly. Plus, to protect your investment, we’ll include a lifetime warranty with your new siding. To learn more about how vinyl siding can benefit your home in Louisville, KY, or southern Indiana, contact Windows Plus today. Are You Ready for New Siding?